If you are facebooker and spend a lot of time on Facebook but what if you don’t have time to read the entire post published by someone on Facebook and you wanted to keep it as bookmark, or sometimes you find places, links movies or any item on Facebook and wanted to explore them later. Facebook recently introduced a save button that act like a bookmark to save your Facebook item to explore later on. You can easily view any item that you have saved using save button from left navigation. Your saved item list is organized by category like post, link, places etc and you can click them later on if you want to explore them or you can share them with your friends later on. Step 1: You need to enable or add favorites saved button on your left navigation of Facebook canvas. For this you tap into more application section from left navigation you will find saved button add it to the favorites. Now would see a saved button with the functionality to save Facebook item to explore them later on this area would show you list of all item available that you have saved them as bookmark. Step 2: Now you can browse anywhere if you find any post, link, places, event or movie you can save them if you want to explore them later. Once you finished doing this you would see item saved in your saved item area on left navigation. You can browse all items you have saved to explore later and if you want to unsaved the post then click on bottom right corner of a post or down arrow ▼ beside post you would see unsaved post option click on it if you want to unsave the post. 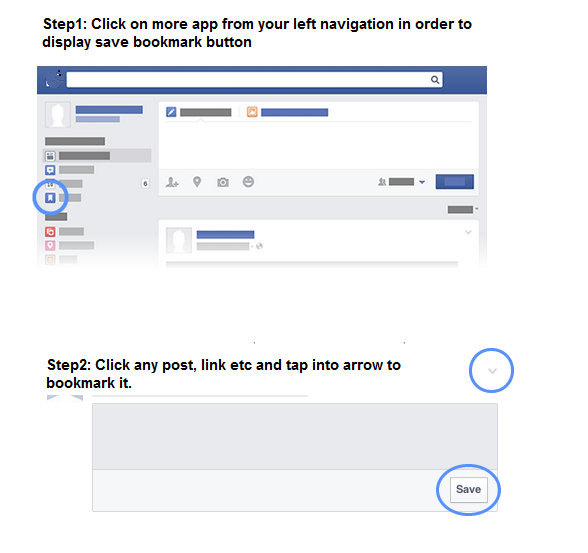 Picture depicting above showing steps how you can display Facebook bookmark button easily in two steps to bookmark item. This picture is for learning purpose only - browse the picture and follow the steps if you want to bookmark item like post,link, music, movie item on Facebook, first display Facebook saved button by clicking on Facebook app more area you will find saved button in application section of Facebook add it to favorites and you are done. And after this browse any post and click down arrow beside post to save it.